I’m a little tardy posting this recipe – excuse me! I cooked these burgers last weekend for a quiet night in. We enjoyed amazing fall weather and sweated through the burgers because they were so spicy! That is your warning – use the Texas BBQ Sauce with caution – although I think I added much more chipotle than recommended. This was the first time I’ve made a coffee rub for burgers and it was a really nice addition – the mix of coffee (I used espresso) and brown sugar helps create a night caramelization on the burger. If you’re nervous about the spice – just skip the BBQ sauce and just do the rub! Take advantage while the weather is still nice for grilling season – I hear we have a cold front coming through soon! PS: I only made half the recipe. Mix all ingredients in small bowl. DO AHEAD: Can be made 1 week ahead.Store airtight at room temperature. Cook bacon in large skillet until crisp. Transfer to paper towels to drain. Break in half. Gently mix chuck and sirloin in large bowl. Form meat into 8 patties, each 3 1/2 to 4 inches in diameter and 1/3 to 1/2 inch thick. Using thumb, make slight indentation in center of each burger. DO AHEAD: Burgers and bacon can be prepared 8 hours ahead.Cover separately and chill. Prepare barbecue (medium-high heat). 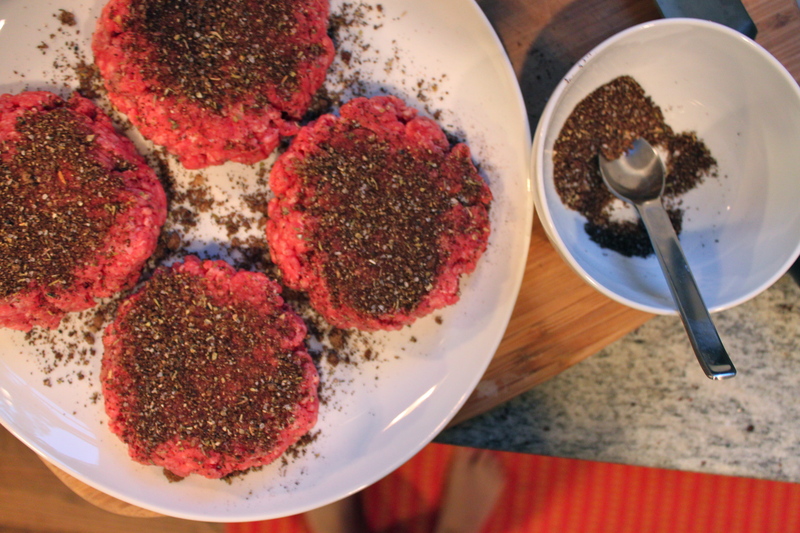 Sprinkle 1 teaspoon coffee rub on top side of each burger. Place burgers, rub side down, on grill rack. Grill until slightly charred, about 4 minutes; turn. Place 2 bacon slice halves atop each burger. Cook 3 minutes. Top each with 1 cheese slice. Cover and cook until cheese melts, about 1 minute longer. Place burgers atop bottom halves of buns. Top with onion slices and tomato slices. Spoon dollop of Texas Barbecue Sauce over. Cover with bun tops and serve, passing additional sauce alongside. I love the coffee rub idea. Nice recipe!